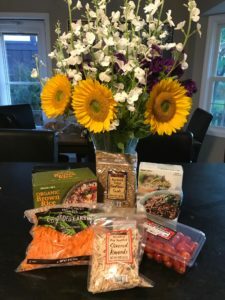 I’m not good at making up recipes from scratch, but I’m decent at taking existing recipes and making them faster and easier to prepare! 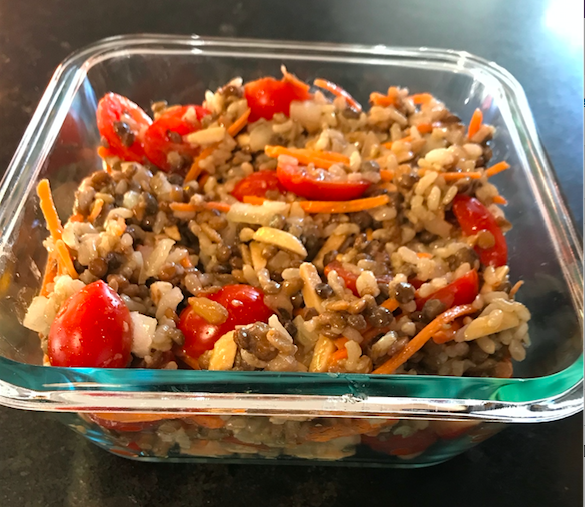 So when I recently came across a recipe for a lentil and rice salad, I knew that with a little help from Trader Joe’s I could make it in under 10 minutes, and even add some extra texture to the original recipe. The real time savers here are the pre-cooked lentils and rice from Trader Joe’s. It came out quite tasty, and is perfect for a weekday dinner or for lunches (it’s one of those dishes that tastes even better the next day). Microwave rice according to package directions. While the rice is cooking, in a large bowl, mix lentils, carrots, almonds, sunflower seeds, tomatoes and onions. Set cooked rice aside to cool slightly. In a small bowl or jar mix oil, lemon, salt and pepper. Add rice to lentil mixture. Top with dressing and mix well. Enjoy!